So I haven’t written anything like this for quiet a long time but I used to enjoy writing film reviews for my own blog a few years back. Jess has wanted me to write them for her blog and wanting the get back into it again, I decided to do it. This is my first in a while so it may not be up to scratch but here goes. Ill try to do more as we often go to the cinema but only if I particularly like or hate something of course. Icelandic director Baltasar Kormakur’s latest movie Everest is based on a disaster that happened in 1996 atop Mt Everest that claimed the lives of eight people. The reference material comes from a book (Into Thin Air) which was written by Jon Krakauer, a journalist who was climbing the mountain in the group which suffered the greatest casualties during the disaster. The film follows an expedition led by experienced climber Rob Hall. Rob’s company Adventure Consultants charged huge amounts of money to adrenaline fuelled hikers in order to lead them to the peak of Everest and had never had any accidents while doing it, which they pride themselves on. The film quickly begins and very briefly introduces the characters just before they start their ascent to base camp. Once there it becomes clear that it is not only the physical struggle or the weather that could endanger the group but also the other companies who are all leading expeditions up the mountain. Rob has to balance all these elements along with the personalities of his clients, all of which are dedicated to reaching the summit, when he and his group finally do, disaster strikes in the form of a massive storm. The movie is very well cast and beautifully acted; Jason Clarke who plays Rob Hall is particularly good. As well as him, his companions on the expedition including Josh Brolin and John Hawkes do a good job of making you care for characters you really know very little about. Some of the best drama however comes from Robs colleagues back at Adventure Consultants HQ at base camp. Emily Watson as Helen was particularly convincing and along with Keira Knightley as Robs wife Jan really help to ground the human element of the catastrophe that unfolds way up the mountain. The main and possibly only problem with the movie is that fact that these characters are not really explored very extensively, we really know very little about most of them which when times get hard becomes problematic when you are supposed to feel for them. This is because there are so many of them perhaps and the opportunity to get to know them all doesn’t really crop up. We get a brief back story of each but ultimately they feel like almost expendable horror movie fodder. For example, although used a lot in the advertising campaign, for obvious reasons, Jake Gyllenhaal’s character Scott Fischer who led another group of hikers and was also caught in the storm is never explored at all so when he is in his most dramatic scenes it is very difficult to care at all. However the film looks stunning and although we don’t normally see any movie in 3D because we screwed up our timings we were forced to either buy the glasses or go home. I was pleasantly surprised by the 3D however and it only seemed to enhance the beauty of many helicopter shots and helped with dramatic impact for scenes where we were hanging over the abyss. Some of the movie was shot on Everest itself, around base camp and a little higher and you can tell. It really helps make the film look authentic and enhances the struggle that the climbers put themselves through. For the later parts of the movie, when the expedition gets higher, they were shot on set but real snow was used to make sure the actors were just as cold if not colder than when they were on the mountain, it also looked more authentic as the usual movie substitutes did not cling to their clothes or beards quite like the real thing. The sound in the movie was also fantastic, once the storm comes in it is almost deafening to the point that when it finally stops and you’re down at base camp you feel relieved to no longer be up the mountain. 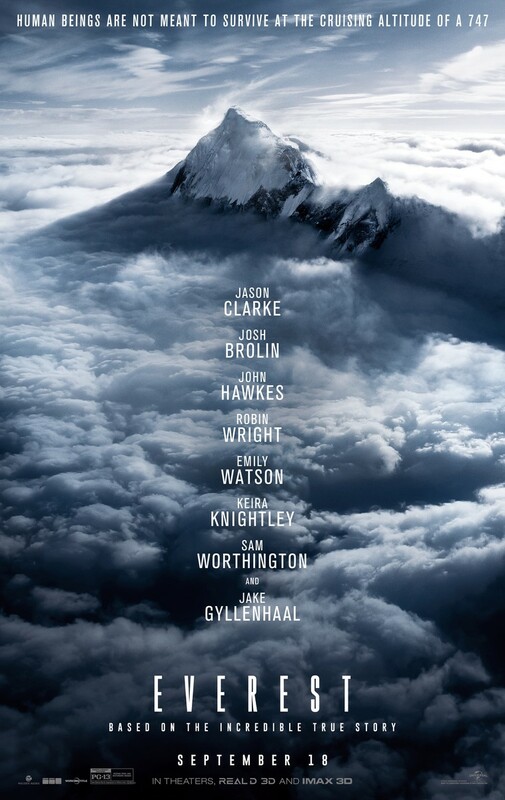 The film touches upon a subject that was rife at the time about the commercialisation of Everest but primarily is about the struggle which these characters go through and the impact that mother nature has on them. Although at times the drama fails because some characters feel like empty vessels the film is one hell of a ride, has some stunning cinematography and the story is fascinating. I feel like it was particularly good in the cinema so if you get the chance you should see it there before it ends but if not it would be great to watch on a cold night when you’re hiding inside with the heating on. I hope you enjoyed this review as it is something I have wanted to feature on this website for a long time as I absolutely love film. Unfortunately, I'm not the best at writing about films but luckily Dave is so we figured this would be a good opportunity for him to write more whilst I get to see more films and feed my Odeon nachos addiction..